Resonance Fundraising Week 2016 – Rare Vinyl Up For Grabs And Much More! First off, the final remaining copy of the Torridon Gate LP, number 100/100, hand-numbered and stamped, screen-printed cover by Hannah Brown and printed translucent sleevenotes. A one-off pressing of 100 copies only, the entire stock sold out in a single afternoon back in April 2015, but we’ve been holding this one back especially. Click on the above image to bid! Secondly, an even-rarer test pressing of latest album Tales From The Black Tangle. Hand-written label, numbered 2/6, in full-colour LP sleeve. This album is also now completely out-of-print and despite lots of harrumphing from the populace in general, there will be no re-presses. Sorry, all, but a promise is a promise! This is your last chance to own a slice of Howlround history! Click on the above image to bid! Next up, and forgive me for banging on about this again, but I really am super-excited about this coming Friday (19th), when we’ll be rocking the Book and Record Bar in West Norwood, with all proceeds going to the fundraiser. Lucky Cat Zoe, Hannah Brown, Michael the Landlord and myself along with very special guest DJ Food will be manning the decks from 8pm and there’s a raffle with fabulous prizes and a bar (please don’t spill any on the vinyl). Rumours that DJ Food will be giving away a large chunk of the records he plays remain unconfirmed, but persistent. Part two of his guest appearance on mine and Hannah’s new Resonance show ‘Near Mint’ is repeated this Friday at 10am, but you can also now listen to both parts on my Mixcloud page here. Speaking of Radiophonics and proof if any were needed of just how important Resonance FM is as an alternative broadcaster, have a listen to Rebecca Gaskell’s documentary on Delia Derbyshire Day that was broadcast last week as part of the station’s regular ‘Clear Spot’ feature. You might recall my BBC report on the event from a few weeks ago, but this goes into far more detail than can be achieved in four minutes and really lifts the lid on just what a remarkable composer she was, featuring lesser known extracts from her archive plus extended interviews with festival curator Caro C, archivist Dr. David Butler and musician Mandy Wigby – plus I’m proud to say I had a small consultancy role and sourced some of the music. It’s always nice to be useful! And lastly, another superb Clear Spot from a couple of weeks ago was ‘Beauty and the Bleak’, produced by Art Assembly’s Julia Dempsey and mixed and edited by myself in a frantic scrabble to meet the Tx deadline – but it was more than worth it! The second of Art Assembly’s in the series of Saisonscape: Decay programmes, this edition features extended interviews with poet and musician Autumn Richardson and sound artist Lauren Bon discussing their work. Their locations and subject matter differ greatly, but their approaches to the subject of decay, isolation and, yes, bleakness, compliment each other beautifully. A real pleasure to work on, this one, event if it was a bit of a narrow squeak to get it finished! Not quite sure where the last week has gone, but here is my report for BBC World Service and Radio 4 regarding the recently released documentary How We Used To Live. Directed by Paul Kelly, written by Travis Elborough and Bob Stanley of Saint Etienne, with a beautiful original soundtrack supplied by the band’s Pete Wiggs, it’s an archive movie that has been getting some splendid reviews, including five whole stars in The Guardian. 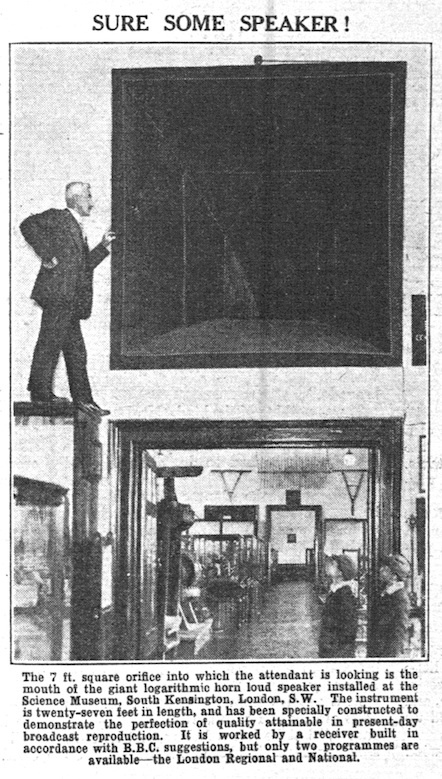 In other exciting news I was granted a rare insight this week into the working methods of the late musicologist, instrument-builder and experimental musician Hugh Davies, with a trip to the Science Museum‘s labyrinthine storage facility at Blythe House in West London. Their vast archive contains a number of his original tape loops and other equipment donated by his estate, and it was my job as a reel-to-reel tape loop aficionado to help with their cataloguing and digitising, along with Aleksander Kolkowski (who you might remember was responsible for the museum’s Denman Exponential Horn exhibition last year) and Dr. James Mooney of Leeds University, whose research project into Hugh’s work was the catalyst for all this activity. The Science Museum Revoxes are a good deal shinier than mine, with lots of extra knobs. And knobs are important. It was a task not without its challenges as much of the splicing tape used to create the loops had dried out completely over the years, requiring careful replacing – but in a way didn’t cause any damage to an already aged and brittle format, which required a most steady hand. 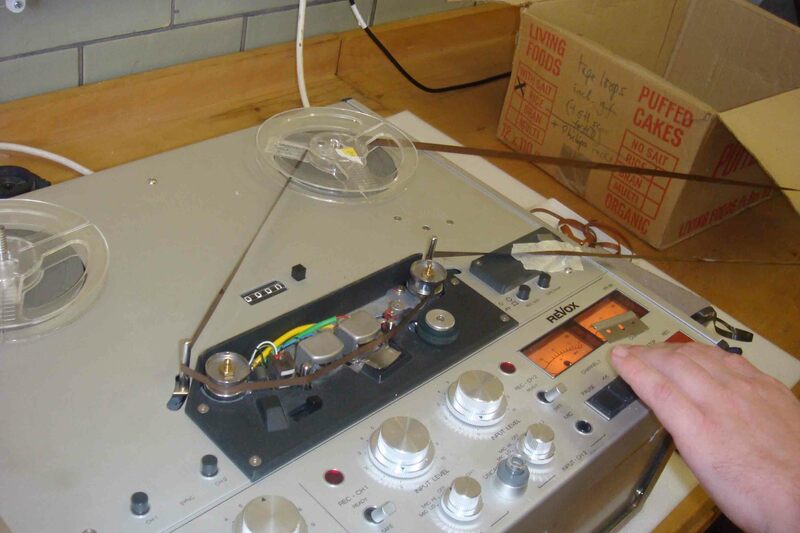 Much of the material appeared to date from the early 1970s, though some may have been a decade or more older than that and indeed I worried that some of the tapes would be completely unplayable – apart from anything else it’s very hard to play even fresh tape loops without damaging them a little, they don’t give up their secrets easily. Thankfully they displayed tremendous fortitude and and nearly all of the loops in the collection rewarded our patience with some strange audio treasure of one sort or another. Housed in a variety of domestic cardboard boxes (including the former home of some Zartbitte Schokolade, complete with Hugh’s hand-written notes, doodles and another annotations, it was a humbling to think that we might be the first people to hear this material in over four decades. And of how much longer the sounds buried within these loops might have survived had they not been captured digitally. 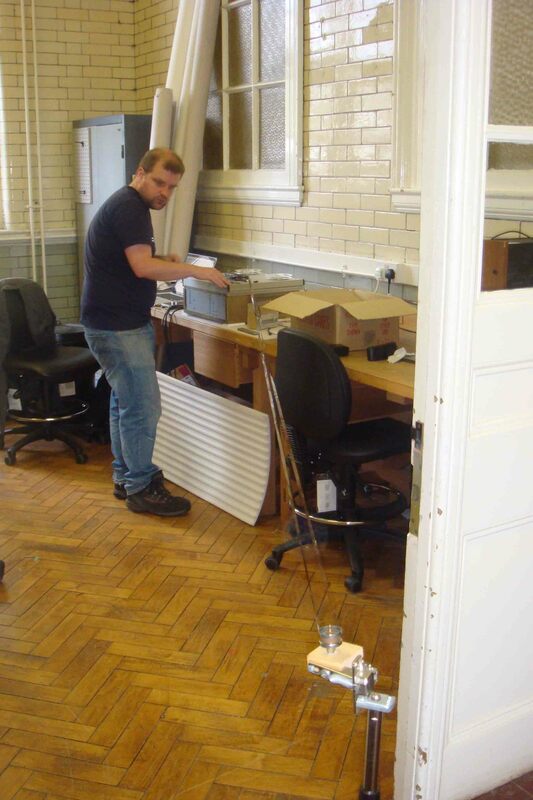 The boxes have disappered back into the archive and who knows when they’ll next see the light of day? It could be another thirty years! Who better for this job, quite frankly?! Obviously I’m unable to share any of this material with you – it’s not my research! But James was very excited by our findings, as we all were, and I’m sure at some point in the future he’ll be ready to share them with the wider world. Until that happens, I’ll leave you with a classic short clip of Hugh at work, including some virtuoso egg-slicer action! 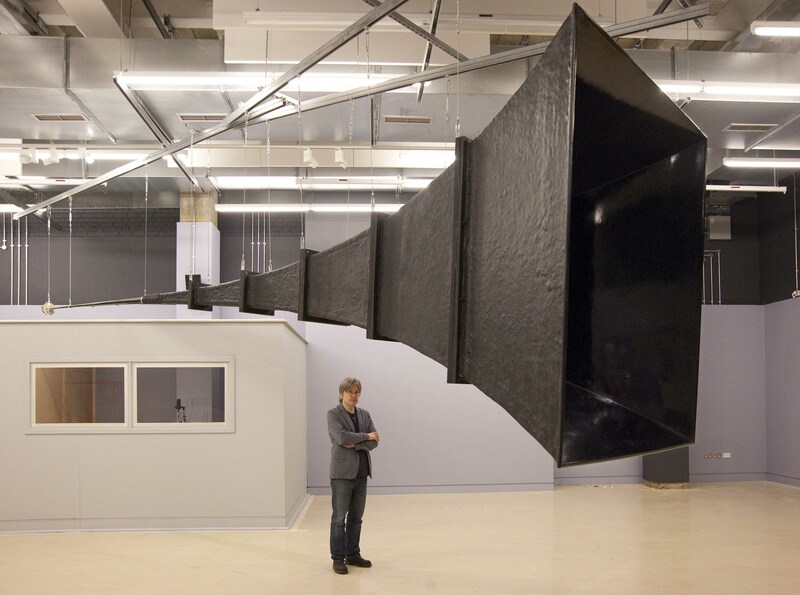 I know I’ve been harping on about the Denman Exponential Horn installation at the Science Museum quite a bit here and on the social networking of late, but the fact is it’s just an amazing object that has to be both seen and heard in-situ to be believed. However, with this report produced for BBC World Service and broadcast last week, I’m hoping I’ve finally got the whole thing out of my system. You’ll hear Aleksander Kolkowski, the audio historian responsible for restoring Roderick Denman’s magnificent creation explaining both the past and present of the horn, accompanied by a selection of sound effects from the BBC archive, selected and mixed by my Foggy self. Those of you who heard my OST Horn Special a month or so ago will find many of these sounds familiar, including the fabulous historical recording of Tutankhamun’s Horn that opens the piece; but given the response I’ve had so far, I can’t imagine repeating this ‘glorious cacophony’ will cause too much upset. And just to clarify, that recording of Tutankhamun’s horn actually dates from 1939, as no original 13th Century BC recordings are thought to exist. I do hope this revelation will not impair your enjoyment too greatly. The exhibition runs until 27th July and I urge you to pay a visit before the horn falls silent again! Presented for your approval, here is last Sunday’s OST Show Denman Horn Special, recorded live at the Science Museum and broadcast, depending on your geographical location, either down a colossal 27-foot exponential horn or on Resonance 104.4FM. Regular host Jonny Trunk was off down the seaside, doubtless trying to bag himself a coconut, or treat the family to some retro donkey-riding action; so once again I was charged with the task of steering Resonance FM’s soundtrack / library music programme through the choppy arts radio waters. I’ve presented the OST show on numerous occasions, but never before had a 27-foot horn to play with, so I was determined that this special edition of the programme should have a bespoke playlist specifically designed to best honour Roderick Denman’s enduring legacy; not forgetting the efforts of Aleks Kolkowski and his team in bringing it back to life. The resulting hour is perhaps a little more ambient and drifty in nature than the usual groovy titillation, but features some quite marvellous new releases from Public Information and Arc Light Editions; as well as some classic radiophonic obscurities. Best appreciated on headphones if you don’t have a great big horn of your very own. As it were. The horn in it’s orginial position, image stolen from the Science Museum’s blog. Resonance continues to broadcast on-site until the end of the month, while the Exponential Horn exhibition ‘In Search Of Perfect Sound‘ continues until the end of July. I urge you to visit if you haven’t already, as nothing can truly replicate the experience of standing in front of the horn. No microphone will do it justice, it’s a full aural immersion, go and hear it while you can!